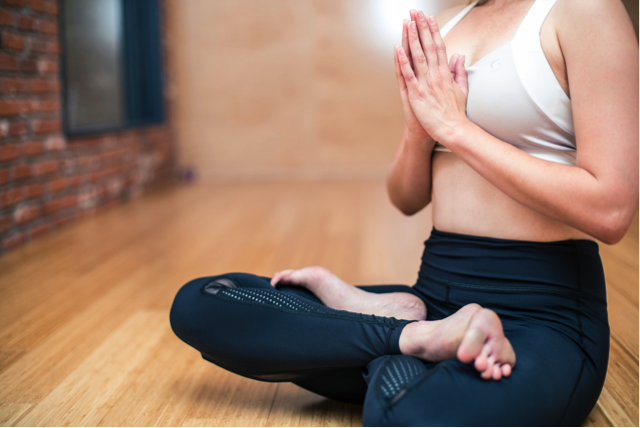 Practicing yoga comes with many physical benefits such as increased flexibility, improved muscle strength, and better cardiovascular health. But the true perks of yoga come from mental gain, as yoga has been proven to decrease stress, fight depression, and relieve anxiety. While attending yoga festivals and conferences is a great way to bond with others in the community, there are plenty of steps you can take on your own to help make the most of your everyday yoga experience at home or at your studio. Start your practice on the right foot by establishing a soothing and effective warmup routine. Identify tight muscles which need to be stretched, and select stretches which help get your body ready for exercise. Many yogis enjoy beginning with child’s pose, then shifting to cat/cow pose. While warming up, focus on your breathing, as it will set the tone for the rest of your practice. Yoga helps you balance your body and mind. To complement this balance it is important to fuel your body with proper nutrition. Making healthy choices before and after yoga class can help you feel more energized in the long run. Before yoga class, have a snack that is easy to digest, like a simple carbohydrate with a small amount of protein or fat. Avocado toast, hummus paired with carrots, or an apple with peanut butter are all smart options. Afterwards, look for snacks with a 3-to-1 ratio of carbohydrates to protein. A smoothie, quinoa bowl, or yogurt parfait are excellent choices to aid in your body’s recovery after exercising. Many yogis appreciate the ancient wisdom of Ayurvedic medicine, which focuses on holistic healing. This includes taking in superfoods like Haritaki into your diet on a regular basis. Full benefits of Haritaki include memory retention, a cleansed digestive system, and anti-aging properties. Staying hydrated before, during, and after yoga practice is an essential part of your overall well-being. Additionally, proper hydration has been proven to have lasting, positive effects on your skin and your mood. It is common to wake up dehydrated as we do not consume water while sleeping. To help your body hydrate in the morning, start your day with a glass of water before you have your breakfast and coffee, as coffee only increases dehydration. Continue to consume water throughout the day, and if it does not seem appealing, take steps to make h20 more interesting and tasty. Adding cucumber or lemon can add a bit of flavor to your water without contributing any artificial flavoring. While consuming water is the primary method to stay hydrated, there are also many foods which can help with the process. Vegetables like lettuce and broccoli as well as fruits like grapefruit and watermelon all contain substantial amount of water, which will aide in your body’s hydration levels. Your body requires sleep, and it is important to make your wellness a priority. In addition to setting aside the time to get a good night’s sleep, you can use yoga to help your body relax in the evening. There are many yoga poses which can be done in bed, helping you get relaxed and comfortable before you sleep. Try the nighttime goddess stretch or reclining bound angle pose to get a good stretch before bed. Improving your yoga practice and your life as a whole is truly about treating your body kindly. Stretching, good nutrition, proper hydration, and relaxing sleep are the gateways to your overall peace of mind. Making small, healthy changes can go a long way. It will change your entire relationship with yoga.